Anyways, I got the fastest train for us to Rome. It's more expensive but it only took 2 hour 59 minutes from Milan to Rome and that's actually really fast. It didn't make any stop and as Mau said it's kinda like a bullet train which I'm sure not really but it was very fast. I spent the time taking pictures from the window. An Italian dad asked us to let go one of our seat so that he could sit with his family and so Mau got to sit with a handsome Italian guy but they didn't talk :( My other entertainment was watching Carlotta, the 3-year old daughter of the family. It's obvious that her dad loves her so much and she's such a daddy girl. She's clingy to her dad. She's very chatty with her dad but when I talked to her she was shy. Too bad I couldn't really get what her dad told her when I asked if she has any brother or sister. Her dad was friendly and her mom as well. They were okay about me taking a picture of Carlotta. Her dad asked if she smiled when she told them that I took her picture. She told them that I took her picture! I was thinking, you're such a tattletale :P Luckily they didn't tell me off or anything. Anyways, we put our luggages and we went straight to the Vatican. Mau booked an entry to the Vatican Museum at 3 pm. So I dropped her off and I went to St. Peter's Basilica. The queue was long but I did stay in the queue. Seeing the basilica again was something that I really felt like doing. Between the queue and the taking a lot of pictures, I didn't have time to do my initial plan which was to visit Castel Sant'Angelo. Instead I went to an exhibition about Pope John Paul II's life which was held next to St Peter's Basilica. The exhibition was in conjuction to his beautification. It did give such an insight about Pope John Paul II as a person. Seeing his conviction and faith in God amazed me and it was really admirable. After I finished with that, as I was walking in St Peter's square, an American dad came to me and asked if I could take pictures for him. I asked him what he wanted to see. He said, his family. It made me laugh. Perhaps my question was rather silly as well. But you know how some people would want their pictures to be taken with certain things and you're being told, please make sure this thing and that are in the picture. For him it was about the family and it's great that way :) I think there were a few generations there. I think there were grandma, grandpa, maybe aunts and uncles and of course the kids. He asked me to take 2 pictures. I had to wait for the second one because as they were changing position, one of the boy was taking his time to pose, a little divo :P After I was done, he stunned me by giving his hand first to shake my hand to say thank you, instead of taking his camera. He was genuinely nice that I was taken aback at how kind people can be. It's like a moment of realization as well of why can't you be that kind to other people yourself? After that, I made my way to Castel Sant'Angelo. I promised that I would meet Mau there when she's done with the Vatican Museum so that we could go to Piazza Navona together since she has booked a Rome walking tour which departs from Piazza Navona. I spent the time waiting for her in Ponte Sant'Angelo. It was a totally Angels & Demons moment for me. You know, I've been in Rome once before this but there are still things that I haven't seen and still haven't seen even after this second trip. She succesfully found her way there. We didn't have a map of Rome, but I did have a print out from google map about the area which I wanted to explore. It really helped. We found Piazza Navona without much difficulty. I left Mau there and off I went to the Pantheon. However there was a mass in the Pantheon when I arrived and so it's not open for tourists and all the tourists were waiting behind the barricades in front of the door. I decided to go back to Piazza Navona and see its fountains and all the artists there. There were many people there for a Friday afternoon. Then I made my way back to the Pantheon. The mass still hadn't finished yet but I decided to wait. After the mass was done, we all went in and I do have to admit that I wasn't in awe as much as I was when I saw these places for the first time. Instead I had a feeling of comfort, a real good feeling for being able to be there again :) After the Pantheon, I made my way to the Trevi Fountain to do the customary coin throwing. Hey, I would really really want to come back to Rome again :) Then off to Piazza di Spagna. There were many people there and I had walked a lot that I didn't feel like scaling the steps to go to Trinità dei Monti. I was also feeling too tired to walk to Piazza del Popolo. I did take picture of the street leading to Piazza del Popolo and over here an Italian guy was like saying hi and hi to me. I was ignoring him but he persisted. So I did stop from taking pictures and look at him and he asked, where are you from. A too freaky question for me that I said sorry and just walked off. Yeah he wasn't that handsome :P but still the whole thing was freaky for me. Anyway the sun was setting, so I decided to go back to the hotel and rest. 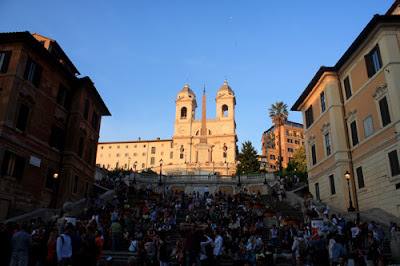 This is a picture of the sun-kissed Trinità dei Monti as the sun was setting. I love how majestic it look. Mau said she had a good time in her walking tour and her Colosseum pictures with all the lights were really pretty. That was Friday. We had Sunday off without any day tour plan because initially Mau asked if she could attend a mass on Sunday in the Vatican. So I'm going to continue this post with the Rome and Vatican story from that Sunday. In the end, Mau said, it's okay not to attend the mass. I still wanted to go to the Vatican because I wanted to see the Pope :P There are 2 ways to see the Pope if he's in town. Come to his Wednesday audience or come to his Sunday blessing. I've been to his Wednesday audience but I wasn't sure about this Sunday blessing. I wasn't even sure where he would appear actually. 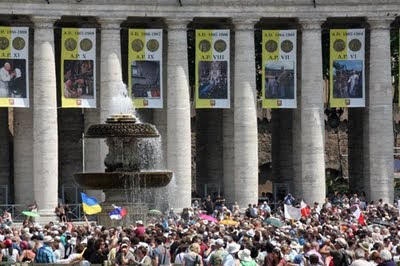 There were many people at St Peter's square at that time. It amazes me how people really love the Pope. He does this twice a week and there are still so many people adoring him to fill up the piazza. People were also bringing flags of their countries and excitedly waving them. I actually wanted to go to Villa Borghese garden. I made my way to Piazza del Popolo first but the drizzle was becoming more like a light rain :( So I just walked straight to Piazza di Spagna and took shelter in Trinità dei Monti. With the rain, the Spanish steps were actually empty of people. It made it nice to walk up without the so many people but it was slippery because of the rain :( I was telling Mau that it would be something to be in the Pantheon during the rain so I actually had a good chance to do that, that Sunday. However the rain really didn't make me feel like I want to walk under it to reach Pantheon. It was chilly as well and I just didn't want to pay 5€ for an umbrella that people were selling. Trinità dei Monti has a special place in my heart. 2 years ago, I found it accidentally and I felt happy seeing it and seeing the view from its ground. On this trip, it gave me shelter from the rain. There was comfort and peace when I was there. I didn't remember how much time I spent there, maybe 1-2 hours. I just sat and started writing in my journal. I hadn't had time to write the days before, so I used the time to write. The rain didn't stop though so after some time I was thinking I should just go back and perhaps take a nap. Anyway, I managed to find Santa Maria in Cosmedin church in which La Bocca della Verità is in but it was closing and they're not accepting any more visitors. An Asian girl pleaded with the guard to let her and her friends in, but he wasn't having it. I wonder if I could sway him if I pleaded in Italian, but I decided to just let it go. I did manage to take a picture of La Bocca della Verità (go see my flickr set) and I saw the remaining tourists queuing to take pictures with it. Then I made my way to the Colosseum. My initial plan was to get ticket to Palatine Hill and the Colosseum. I really loved Palatine hill the last time I was there. However I was there quite late so I decided to just take pictures around the Colosseum. The sky was blue now. Seeing the pictures, I had some really nice pictures from there. After that, I went back for dinner with Mau. That was my Sunday in Rome. It's a city which I've visited twice now and as much as it can be so chaotic sometime with the so many tourists there, I think I actually love it more now :) Of course I want to come back there again. I threw coins into the Trevi Fountain, so I really hope I'll be there again soon. For pictures of the Vatican, you can go here, and for pictures of Rome, you can go here.